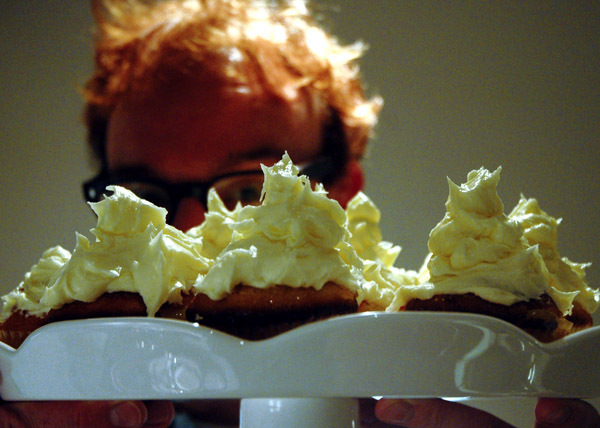 Guy dropped into our new flat on Saturday evening then we strolled to his for dinner. I say this because it's amazing to be able to walk between houses in London at all, it's so huge, rather than it being some sort of progressive dinner party (especially given all I offered by way of nibbles was a bag of twiglets). 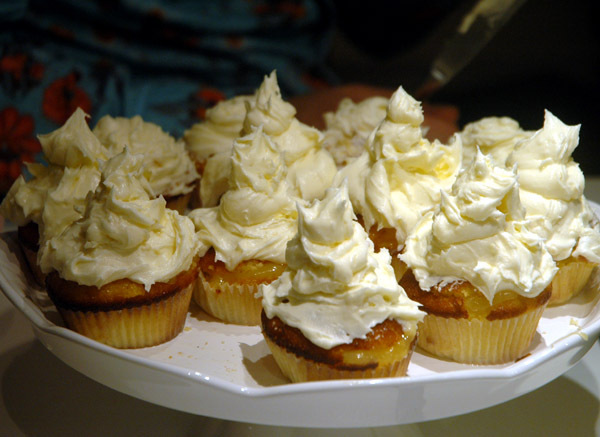 When we arrived at Guy's he pulled out the kitchen stadium big guns; scrumptious potato, rosemary and parmesan ravioli with wild mushrooms followed by his signature dessert: cup cakes (this time, Lemon Four Ways). Adam and I waddled home trashed and very, very full. Both the pasta recipe and filling were adapted from Giorgio Locatelli’s Made in Italy: Food and Stories. You will get four decent serves. Make a well in the flour and mix in the eggs, first with spoon then your hands. I also then push a small hole into the dough and fill it with olive oil and knead for about 10 minutes until well combined. Cover in a damp cloth and sit for 30 minutes. 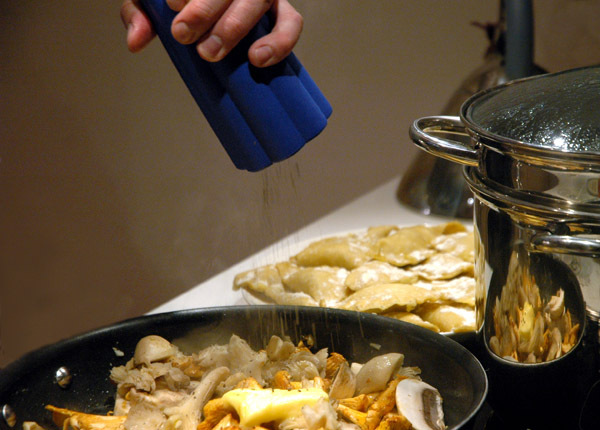 Roll out with a pasta maker (or rolling pin). Cut into circles to make ravioli pockets. Chop, boil, drain and mash the potatoes. Melt the butter with the rosemary sprig in it then remove the rosemary. Add the melted butter and grated cheese to the potatoes. Season with salt and pepper and combine. Fill the ravioli circles using either a mould or buy placing a blob of filling onto the centre of one side of your circle, then folding it over and pressing the edges together. Locatelli added a mint leaf to each ravioli which I did not. You can make the ravioli ahead of time. Just cover them and put them in the fridge until you need them. When the sauce is five to ten minutes away, drop the ravioli into boiling, salted water (a few at a time.) Let them rise to the surface then carefully ladel them out with a slotted spoon and place them in dishes. 3 lots of fancy mushrooms. I chose enoki, oyster and some orangey ones (girolle). Choose them for looks. I like enoki as they taste great and have an interesting texture. Heat some oil, add crushed garlic, then the mushrooms and thyme. 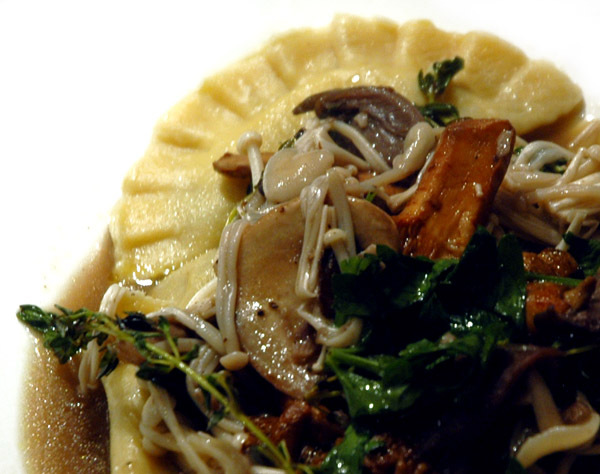 Add the more robust mushrooms first (enoki only go in for a few minutes at the end). 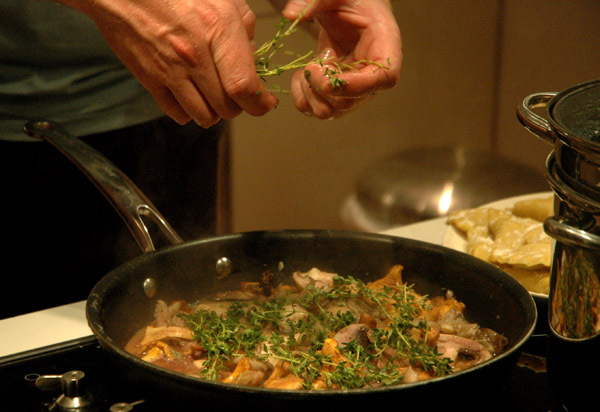 Once the first mushrooms are starting to soften, add 1 cup of red wine, follwed by some stock and salt and pepper. Cook for no longer than 10 minutes so they don't shrivel too much, but enough to reduce and thicken the sauce. 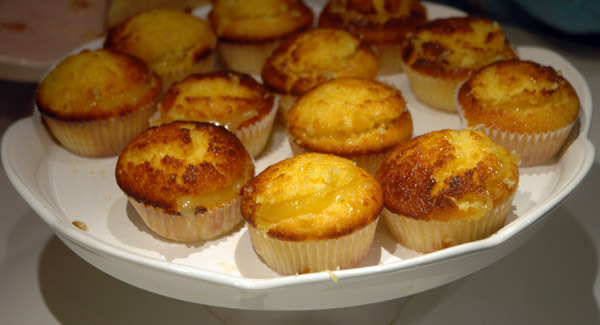 Once baked, I drizzled the cupcakes with lemon syrup (heat the juice of 2 lemons with 150g of sugar until the sugar dissolves) and then made a cut in the cupcakes and filled them with lemon curd. Whisk all the ingredients together until fluffy. You can cut down on butter and add milk or water if it is too buttery.